Eric Ashton was the epitome of a rugby league hero. Had he bestridden the American Wild West rather than the mean Lancastrian streets of Wigan and St Helens - those deadly rival towns whom he managed otherwise to unite in mutual respect for his sporting prowess - the lean, tall and taciturn Ashton would have made the ideal gunslinger. 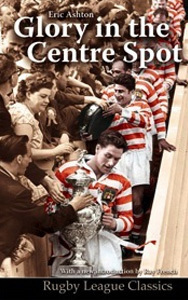 Glory In The Centre Spot is his autobiography, first published in 1966 and until now long out of print, rebranded as the third book in Scratching Shed's Rugby League Classics series. Paperback, 216 pages. A gentleman to his bootstraps, Eric Ashton was renowned for fighting fair and with flair. Blessed with matinee idol looks, he despatched opponents with consumate and deadly skill; in his case via a perfectly-judged hand-off or bewildering scissor-move pass. In Glory In The Centre Spot, his autobiography, first published in 1966 and until now long out of print, the man himself reveals how, after being turned down by his beloved hometown Saints, he went on to form a devastating threequarter partnership with Welsh wing wizard Billy Boston at Wigan’s Central Park. After arriving in 1955, Ashton would captain Wigan for twelve seasons - and win three Challenge Cups among a host of other domestic honours. He captained Great Britain and earned twenty-six caps in an era when the Lions were a powerful international force. Indeed, he led Great Britain to World Cup victory in 1960 and went on the victorious 1958 and 1962 tours of Australia, latterly as captain. Here, in the third in a series of republished Rugby League Classics, his story is retold, accompanied this time by a brand new introduction from BBC commentator Ray French, Ashton’s long-time friend and colleague. An array of photographs and assorted appendices are also included, along with an afterword in which a successful future coaching career and fifteen subsequent years on the board of St Helens are outlined. Eric Ashton MBE died, aged 73, in March 2008. Glory In The Centre Spot is a fitting monument to a man who brought style and grace to the toughest team sport on the planet.